I realize that not everyone will adore this gift selection as much as I do. If you have a loved one on your list who loves vintage and pink, this is perfect! I have always loved vintage items. There was a little shop in Palmyra that Mom used to buy me things from as gifts--they may have been "pre-enjoyed", but I love the history behind vintage things. I like to have things that aren't at every shop at the mall--something that reflects my personality. As long as it's not shoes or underwear, I think of buying pre-enjoyed items as a great form of recycling. I stumbled upon these pink cups in the Etsy shop kathleensue. 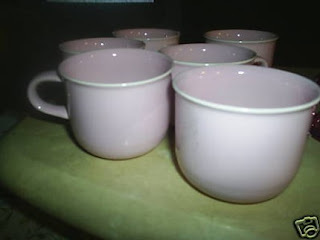 I haven't seen new pink cups in a while--and they would go great in my watercolor soft green kitchen or in my lavender dining room (in a house of males, I do need some feminity through my decorating). For your vintage loving friend, these cups (6 for 14.99) would be great in an old basket or rusty tin pot even with some of the great Etsy coffees and teas as a gift.